Private collection, USA, until 2016. J. Ingamells, ‘Andrea Soldi – A Checklist of his Work’ from The Walpole Society, vol. 47 (1978 – 1980), 1980, no. 68, p. 17. The piercing stare of this unknown gentleman engages so directly with the viewer that it has the arresting quality of a self-portrait. Indeed, the sitter bears some physiological comparison to Soldi’s self-portrait from 1743, in spite of his unusual long beard. The portrait’s date, 1734, places it clearly in the Levant, most likely in Aleppo, where Soldi is known to have been active as a portraitist at that time. 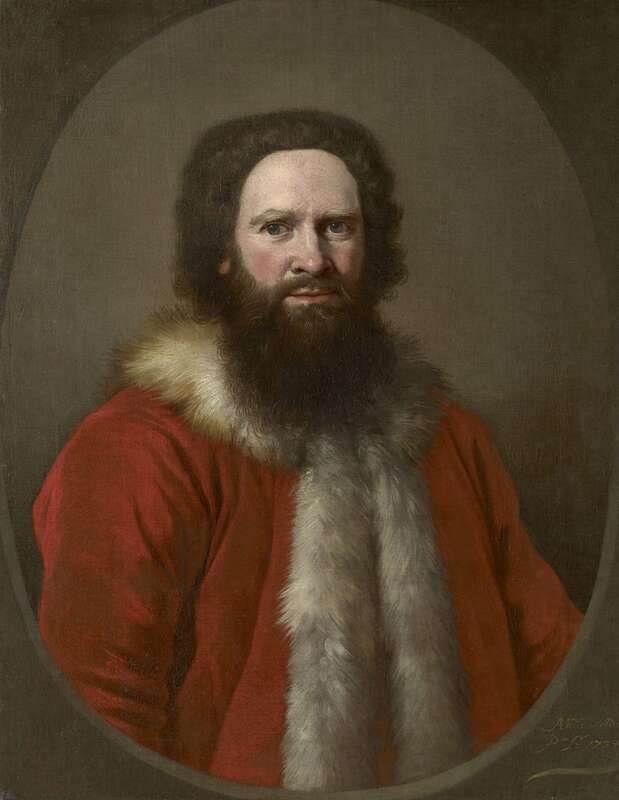 The sitter’s lavish red velvet fur-lined outer gown (‘Turkish robe’) and exaggerated facial hair further confirm the painting’s Orientalist connections. Only his pale blue eyes serve as a reminder of his western roots. Soldi’s bold use of colour and dexterity at rendering different textures, as show-cased here, would ultimately set him apart from the old and middle-aged guard of native portrait painters in England, (Richardson, Dahl, Jervas, Seeman and Vanderbank), securing his success as a society portrait painter on his arrival in London in around 1736. All biographical information on Soldi’s early years comes from the antiquarian George Vertue, who first noticed the artist in 1738, writing that he ‘came to England from the voyage he had made into the Levant Turkey Constantinople &c’, and again in 1742 noting ‘at Alleppo he became acquainted with some English Merchants, whose pictures having drawn, with much approbriation, they advised him to come to England which he did – with some of them’. Only a handful of works from this period are dated, the two earliest inscribed 1733 and the latest 1736, all of ‘Pashas’ – English merchants of the Levant Company who sported Turkish robes and pelisses, as well as long moustachios. Our portrait is unique among this small group in presenting the sitter with a beard, and without a turban. Its format is the simplest and most intimate, unusually without props or a background – he appears simply in a feigned oval. As such it doesn’t seem to have been specifically devised as a conscious display of mercantile trappings. This is surprising, for as Tabitha Barber has noted, Soldi’s portraits from Aleppo were for the most part ‘embellished to impress a home audience... [and that] Aleppo society was acutely conscious of wealth and status – the English merchants were careful to wear costly furs and silks, to pass as men of rank: Soldi’s portraits of young gentlemen enjoying the pleasures of the Levant reflect the general view of the merchants as rich, powerful and privileged individuals. But they hide the reality of a trade which by 1735 was in decline’. Although Soldi’s patrons from that time can be identified as the representatives in Aleppo of the English Levant Company, who lived and worked in Syria’s ancient trading capital, that is not to say that our sitter is necessarily English, nor a merchant, though it is certainly a possibility. As an Italian artist in the city, we can assume that Soldi may also have painted itinerant Italians and other European representatives in Aleppo. The city commanded the great trans-desert trading routes between East and West, chiefly for silk, from Antioch, Tripoli and Beirut, but the most prized from Persia. After an eighty-mile journey over the Amanus mountains from Aleppo’s port Scanderoon (Iskenderun), the city, with its high citadel, domes and minarets, must have presented an impressive prospect. However, its narrow streets were rife with infection and disease, including plague. The English merchants lived within the Khan al-Gumruk, which was situated on the main thoroughfare of the covered, labyrinth-like souk in the heart of the city. A masterpiece of commercial Ottoman architecture, Khan al-Gumruk survives today and is still occupied by textile merchants. Tabitha Barber notes that the merchants were often based in Aleppo for up to seven years or more, and in search of entertainment they visited archaeological sites, including Palmyra and the Dead Cities, and hunted and dined together. In the late 1730s, having left Aleppo at the persuasion of the English merchants, (according to Vertue), Soldi was attracting notice in London as a portrait painter very much in vogue. There he forged an initially successful career as a society portrait painter, but by the 1750s had run in to financial difficulty, even imprisoned for debt. Nevertheless, throughout his years in England he retained the loyalty of those he had known in Aleppo, now wealthy London merchants, directors of the City’s financial institutions and owners of country estates. The likes of Henry Lannoy Hunter, the Bosanquets, Salweys and Radcliffes, all continued to commission works from the artist. Nonetheless, Soldi was driven to apply to the Royal Academy for charity in 1771, the year of his death, and it was Sir Joshua Reynolds who paid for his funeral. There are two recorded self-portraits from two distinctive periods in his inconsistent career; York City Art Gallery, dated 1743, and Newburgh Priory, painted c. 1760. G. Vertue, Notebooks 3, pp. 84 & 109. Ingamells notes the most impressive of these being Soldi’s portraits of the same sitter, the English merchant Thomas Sheppard (d. 1757) – ‘Andrea Soldi’, by J. Ingamells, Connoisseur, vol. 185, March 1974, p. 192. In his checklist of Soldi's works in the Walpole Society (XLVII, 1980), he lists only three portraits from the artist’s Aleppan period: the two three-quarter-lengths of Thomas Sheppard (signed and dated 1733(?) and 1735/6 respectively; both location unknown; ibid., p. 15, nos. 57-8); and a portrait of an unidentified gentleman, small-whole length, with moustache, wearing Turkish trousers and slippers (signed and dated 1735; private collection; ibid., p. 17, no. 69). Research into Soldi's portrait of the English merchant Henry Lannoy Hunter (c. 1733-6), acquired by Tate in 2005, has helped put Soldi’s early career in the Levant into sharper focus, and Tabitha Barber’s exhibition on Soldi and the English Levant merchants in 2008 brought to light more works from this early, formative period. Tabitha Barber, Soldi and the English Levant merchants, exhibition at Tate Britain, 2008. With thanks to Tabitha Barber for providing the Weiss Gallery with her text for this show. The English Levant Company was established in 1581, and had a monopoly on trade between England and the Ottoman Empire. Run by a Court of Governors in London and represented by the English Ambassador in Constantinople, its chief trading post was Aleppo, the trading capital of Syria.